Physical therapists heal patients who received injuries that require long-term care but don't require a long stay at a hospital. 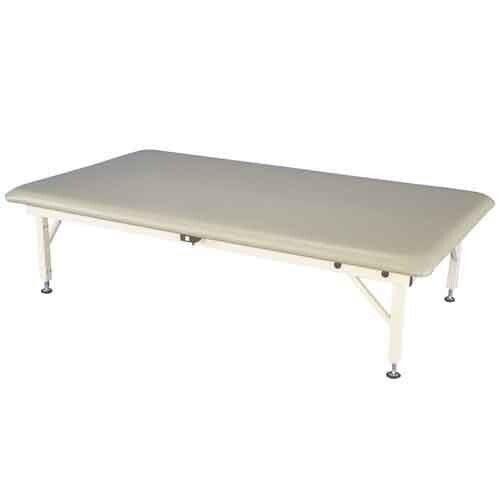 Armedica's Electric AM 640 and 650 Mat Table are made for physical therapists or physical therapy businesses. These tables are designed to give patients a soft area to sit or lie down. This soft surface offers the patient the most comfortable experience while working on their biggest needs: therapy for their arms, legs, back, neck or any other part of the body. The AM640 and AM650 models are made with all-steel frames capable of holding up to 900 pounds. The steel legs are polished and finished to match the upper leg coverings and the 34-ounce heavy-duty vinyl comes with a bacterial protection shield. The steel frame has a Hi-Lo design, aided by a switch on the side of the treatment table can increase or decrease its height. The seamless stitch around the corners means patients won't get snagged or stabbed by an errant outward-sticking stitch or hard piece of plastic. As an add-on feature, the AM-640 and 650 has an optional footswitch. The accessory easily attaches to the side of the table and is able to adjust the table for optimum usability for the customer and the therapist.